At Meadowstone Farm we raise a variety of animals for cheese, eggs, and meat. We take the same care for our animals as we do our vegetables. We provide them with the space they need to forage and interact, while also offering them quality organic grain and nutritious hay. We rotate our animals throughout our pastures to provide a new space with more insects, grass, and plants for them to eat. Ideally, our rotation starts with the goats and their munching of the grasses and weeds. The pigs follow, tearing up the sod as they root for grubs and eat the quack grass roots. The chickens come in last to bat clean-up on the insects and vegetation. After a re-growth period, the goats are put back on the pasture to start all over again. We also dedicate fields and gardens to growing crops specifically for animal forage. We'll grow a garden of oats, mangrel beets and/or forage turnips and let the pigs loose on the garden in the early fall. Our pigs also spend much of the summer foraging in new forest location each year. They love the shade of the forest where they root for acorns, find hidden apple trees and relish being pigs! We raise and milk Alpine, Nubian, and Sannan goats for the production of goat cheese and meat. We have 15-20 goats on the farm, including our bucks, Prince and Nevada. Bobby, our first buck, passed away in the spring of 2017. His silhouette is the inspiration for our logo. We became a licensed goat dairy in 2008 when we milked a handful of goats, since then we have slowly been increasing our milking does around 20. We also sell bred does in the late winter and kids in the spring. Occasionally we have goat meat available at markets and our stand. We make primarily feta and chevre, which you can find in our farm stand, farmers markets and at the Littleton COOP. We hope to continue learn more about goat cheese production and add a few more aged varieties in the future. Folks notice that the taste of our cheese is not always exactly the same, whereas commercially available milk and cheese never changes. That is directly related to their diet and the seasons. 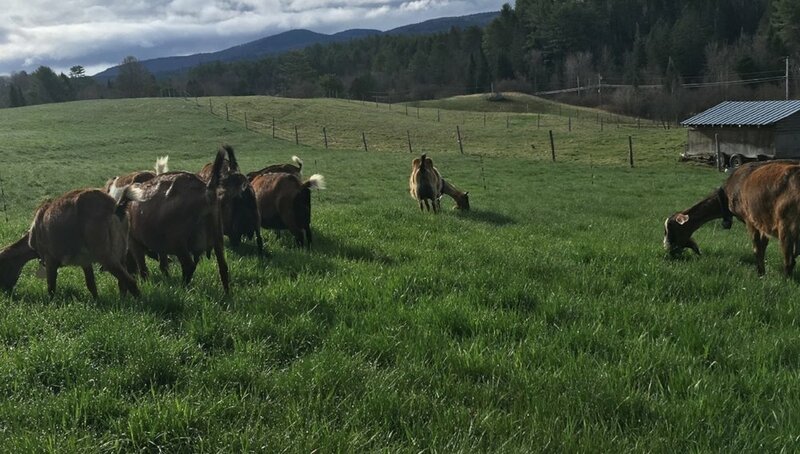 Our goats are always outside and throughout the season the grasses they eat change, while large scale commercial operations never let their animals see pasture and are fed the same diet every day of sillage and grain. The lush spring grasses on Meadowstone Farm produce the "freshest" tasting milk of the season, great for making chevre. As the summer progresses, the grasses get tougher and slow down their growth and the milk becomes more flavorful, perfect for our feta and tomme. Our chevre is seasonal, lasting only from May- October. To keep with the natural cycles of the goats(and to give us a break:) we dry off our does in mid November and begin milking again 10 days or so after they have kidded in mid March and April. We do offer feta and tomme year-round. Although we make every effort in making sure our goats are healthy and happy, occasionally they get sick(just like humans) and need medication. Under the direction of our veterinarian, we have used antibiotics. When doing so, we double the recommended milk withholding time and have an antibiotic test kit on hand to check the presence of antibiotics before using any milk. Besides spending copious amounts of time on fresh pasture(in season) they eat Morrison Organic Dairy Grain and occasionally get a few scoops of spent brewery grain as a treat. We supplement their feed with organic kelp. Throughout the milking season they receive an herbal dewormer, but occasionally if the parasitic pressure is high we do use a chemical dewormer with no milk withdrawl time. Since 2004 we have raised chickens for eggs and currently have about 300 chickens of various breeds. We provide our chickens room to roam, and move them throughout our pastures in our chicken trailers(repurposed RV's). We feed our chickens Morrisons Organic poultry feed(60% of diet) along with food scraps(15%) we pick up from area restaurants and grocery stores. In addition to helping decrease food waste entering landfills, the food scraps provide the chickens with a more varied and healthy diet. We also collect and feed our layers spent grain(25%) from a local brewery. A good intro article on spent grain is here. Currently we are no longer raising broiler chickens. You can contact Zach Mangione at Cross Farm in Barnet, VT for Certified Organic, pasture raised birds, or stop by our farmstand to pickup one of Zach’s delicious chickens. As of 2014 we are no longer raising turkeys. You may contact Justin Smith at Green Bough Farm in North Haverhill if you are looking for some. Or Zach Mangione at Cross Farm in Barnet, VT for Certified Organic, pasture raised birds. For a number of years we were thinking of getting into the cow business and finally jumped-in in the fall of 2014. The breed we settled on are Milking Red Devons, which are an old English/New England Heritage breed. They are an original farm tri-purpose breed: dairy, beef and work(r.e. oxen) and they thrive on sub-par pasture and grasses. We have them primarily for beef, but may milk them in the future as their milk has a high solid content and makes awesome cheese. We also use them in our animal rotation after the goats, because not only will the cows eat what the goats don't, but they'll also crop the grass much closer to ground(but not too close) allowing for stronger and faster regrowth. We raise about 30 pigs each year and they travel as a group, tearing up the earth in search of bugs, insects, and plants to eat. They are fed Morrisons Organic Grain(75%), spent grain(15%) and the Cheese Whey(10%), a protein rich bi-product from making goat cheese. We use no hormones, antibiotics, or medications on our pigs. Our pigs are slaughtered at PT Farm in North Haverill, NH and our bacon is smoked nitrate free at Green Mountain Smokehouse, in VT. We sell a variety of organic pork products; no preservatives are added. If there is a specific cut you would like that is not available, call us, and we can get it for you with the next group of pigs.